He spoke of the importance of helping the environment by using "alternative methods of fuel" – after driving down the red carpet on a Harley Davidson. "It [global warming] is a very valid issue," Travolta declared. "I'm wondering if we need to think about other planets and dome cities. "Everyone can do their bit. But I don't know if it's not too late already. We have to think about alternative methods of fuel. "I'm probably not the best candidate to ask about global warming because I fly jets. "I use them as a business tool though, as others do. I think it's part of this industry – otherwise I couldn't be here doing this and I wouldn't be here now." 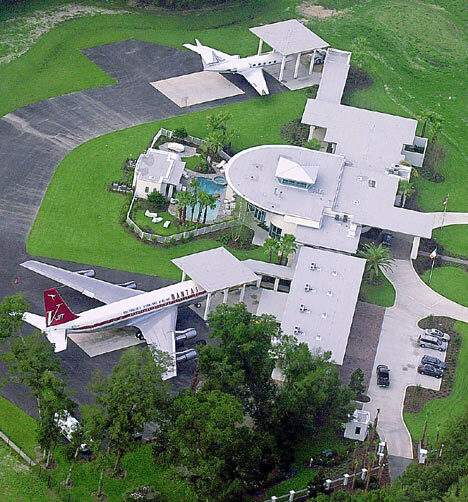 Travolta's five private planes – a customised £2million Boeing 707, three Gulfstream jets and a Lear jet – are kept at the bottom of his garden in the US next to a private runway. Indeed, such is his enthusiasm for flying, he persuaded his wife, actress Kelly Preston, to name their son Jett when he was born 14 years ago. Five years ago he piloted his own Boeing 707 on a 13- city "Spirit of Friendship Tour" for Qantas, taking in Los Angeles, Auckland, Sydney, Singapore, Tokyo, London, Paris and New York and amassing over 35,000 flying miles. More recently, a gruelling promotional schedule for his two latest projects, Hairspray and Wild Hogs, has seen him fly extensively over the past year. This includes a country-wide tour of the US and a visit to Canada as well as this week's appearance in Leicester Square. Such prolific mileage means that, over the past 12 months, he has accumulated around 800 tonnes of carbon emissions. One of the world's leading climate change businesses, the Carbon Neutral Company, has written to Travolta, suggesting ways he could reduce these alarming levels. He has yet to respond to their advice. Environmental groups were quick to criticise Travolta for "discrediting the cause". John Buckley, managing director-of CarbonFootprint.com, said: "John Travolta has such a high-profile celebrity status, so what he says carries an extraordinary amount of weight. "So it is such a shame when someone of his standing is so outspoken about green issues, yet fails to practise what he preaches. "Unfortunately someone of his standing ends up discrediting the cause itself, because he is saying people should protect the environment on one hand, yet travelling on a private plane on the other. "Green issues are serious and should be treated as such. "It is vital for celebrities to toe the line when they speak out in support of it." Five private jets, a huge mansion in Florida, a 42 room mansion in Maine and he lectures on global warming? I'm sorry, I'm reading these quotes from John Travolta about how the situation is so dire that we might need to look at domed cities or other planets to live in. The I see the picture of his driveway with not only cars, BUT ****ING JETS parked next to his house, and I'm laughing hysterically. This is clearly an unbalanced individual. You have to kidding me. No one in their right mind would preach to others about global warming, while having two jetplanes parked in their goddamn driveway. Another self-righteous arrogant prick talking about global warming. What a surprise. What a fitting Movie Title Wild Hogs! What a cheapskate! Couldn't even afford an entire hanger for his jets? What a loser! Neighbors must just love him- and I can't even use my lawn mower before 8AM!